Thrill seekers have been coming to the Outer Banks to learn how to fly ever since the Wright Brothers first took off from here over 100 years ago, but the newest craze is unlike anything we have ever seen before, a unique blast off into the future of personal recreational aviation with OBXjetpak! 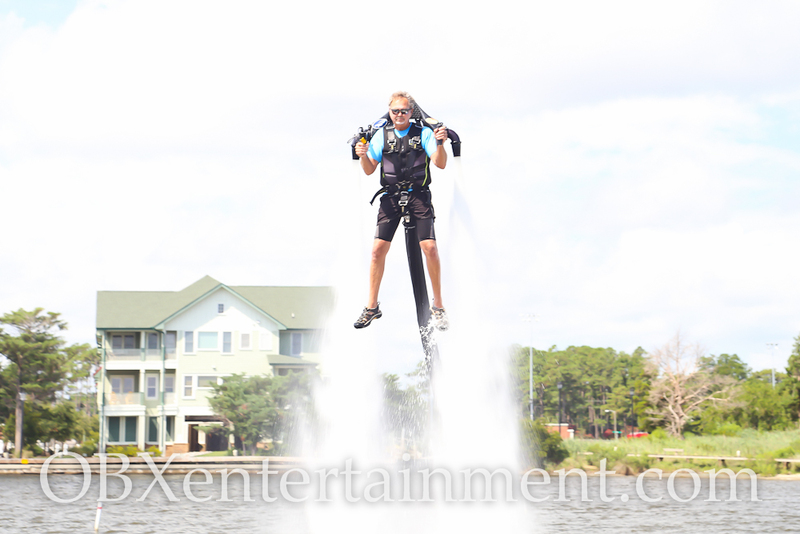 OBXjetpak is essentially just what it sounds like, a high-powered, futuristic-looking jet pack that is strapped onto your back that uses water pressure to shoot you up to 30 feet into the air above the sound near downtown Manteo. In 2013, OBXjetpak was featured prominently in two episodes of the hit HBO comedy series Eastbound and Down during its final season. which was shot in Wilmington, North Carolina. OBXjetpak owner, pilot, and Nags Head resident Butch Stone helped with the filming of the HBO series Eastbound and Down and got to meet the show’s stars, including Danny McBride (Pineapple Express) and Ken Marino (Reno 911), both of whom tried out his jet pack. Since then, Stone and his jet pack were also featured on The Weather Channel and in a commercial for the Virginia Lottery, and he has performed soaring demonstrations for enthusiastic audiences at the annual Harborfest celebration in Norfolk, Virginia for the last two years, following the USS Cole in the event’s popular Parade of Sails. You can learn all about OBXjetpak, what it’s like to to fly, and what it was like working with the cast and crew of Eastbound and Down in our exclusive interview with owner and pilot Butch Stone on Episode 9 of our original Outer Banks web series OBXE TV, which you can watch in its entirety in the player below! You can also watch Part 2 of our feature on OBXjetpak on Episode 22, in which OBXE TV host Sue Artz goes on location and tries out the jet pack herself, and you can see Stone in action as well, in the player below! Click here for more stories on what’s happening at OBXjetpak, and be sure to browse through our photo gallery below! To learn more, please visit OBXjetpak.com, or book your flight today at the Kitty Hawk Kites site under “JetPak Adventure” (click here), or call 877-FLY-THIS.